It’s a reasonable question, and one we hear all the time, especially from newcomers to paid search. After all, those new to PPC are probably most interested in how much they’ll be expected to shell out to advertise on Google, and whether they can even afford it! The cost of AdWords depends on several variables. In this post, I’ll explain how these variables will impact your ad spend, and demystify the concepts you’ll need to understand in order to set a realistic budget for your ad campaigns. The average cost per click in Google AdWords is between $1 and $2 on the search network. The average CPC on the Display Network is under $1. The average small business using AdWords spends between $9,000 and $10,000 per month on their Google paid search campaigns. That’s $100,000 to $120,000 per year. Now, let’s examine these points about AdWords costs more closely. Before we dive into the figures and start talking cost, it’s vital that you know how the AdWords platform actually works. One of the biggest misconceptions about AdWords is that whomever has the most money to spend has the most influence. While a bigger ad budget never hurts, AdWords is actually a more level playing field than many new advertisers realize. Google AdWords functions in essentially the same way as an auction. Let’s take a look at how this process works. The ad auction begins when a user enters a search query, after which Google determines whether the query contains keywords that advertisers are currently bidding on. 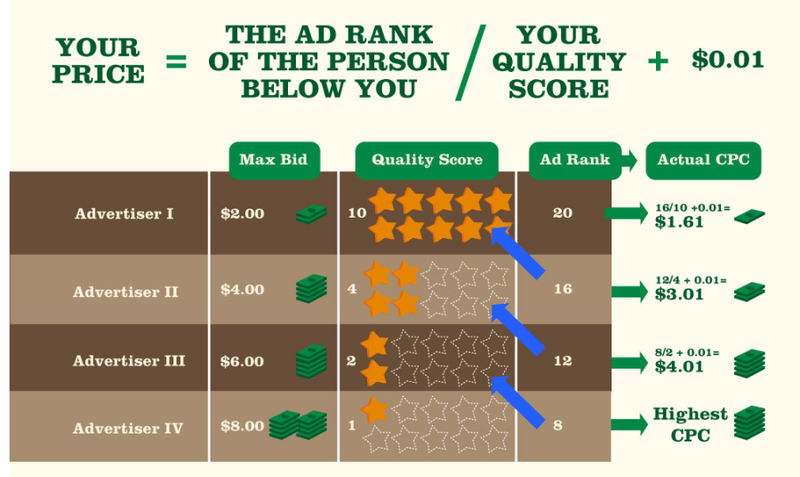 Notice how Advertiser I can pay less for a higher position due to their better Quality Score? This is essentially how AdWords works in a nutshell. There are variables that aren’t covered here, such as alternative bidding methods and ad formats, so if you want to learn more about how AdWords works, check out the full infographic here. Now we’ve brushed up on the fundamentals, let’s dive into the numbers. How Does My Google AdWords Budget Get Spent? A common scenario that many newcomers to paid search find themselves in is when their advertising budget gets spent much more quickly than they anticipated. Understandably, this can be quite a shock. Advertisers might assume their ad budget will last them for a month, only to discover that they’ve blown through their budget in a matter of days. This can lead to yet more misconceptions about paid search, namely that it’s prohibitively expensive. However, this isn’t necessarily the case, and is more often than not the result of a misunderstanding of how budgeting works. You can think of ad budgets in the same way you would about any other budget. You start with a core figure that will represent the majority of your ad budget, and allow for a little leeway in case things change or something goes wrong. One way to start budgeting a PPC account is on a per-campaign basis. Each campaign has its own unique settings tab in AdWords. This allows you to control specific parameters of each campaign independently of other campaigns in your account. Each campaign should have its own daily budget. If you’re running several campaigns simultaneously, you should think about which campaigns have priority. For example, a campaign advertising your best-selling product may be more important to your business than another campaign promoting content to prospective customers at the top of the funnel. In situations like this, you might want to allocate a larger daily budget to the product campaign. If you’re planning a monthly PPC budget, all you need to do is calculate the breakdown of daily budgets for each campaign, and allocate your funds depending on the priority of each campaign. In this example, 25 cents is the most that you’d be charged if 25 cents is your maximum CPC. However, the actual amount you could be charged per click can change, depending on the variables of each individual ad auction. Just remember that, if you set your maximum CPC at 25 cents, you’ll never pay more than that for a click – but you might end up paying less. Sounds simple enough, right? Well, there are several factors you should consider that can impact your PPC budget, the first of which is dayparting. Also known as ad scheduling, dayparting is the practice of specifying when you want your ads to appear to prospective customers. Although your ads will still have to go through the ad auction process, you can tell Google when you want your ads to be displayed. This is especially useful for local businesses that want to drive customers to a physical location through their ads. If you run a bakery that closes at 7 p.m., for example, you may not want your ads to be shown outside your normal business hours. Alternatively, you can specify that your ads run continually throughout the day, but allocate a greater portion of your daily budget for hours during which you want increased visibility. To learn more about dayparting and ad scheduling, check out this guide. Just as you can allocate more of your budget to certain times of day, you can also spend more of your budget on certain geographical areas. This technique is known as geotargeting. Geotargeting allows you to prioritize the display of your ads to searches coming from specific areas. These areas can be as large as a state or province, or as small as a three-block radius from your store. Geotargeting can be an excellent way to capitalize on growing mobile traffic trends and on-the-go shopping habits of today’s consumers, and it might factor into how you allocate your daily ad budget. For example, you may want your ads to appear alongside relevant searches in a particular state, but you could also allocate more budget to searches conducted in a specific city or even neighborhood. Long gone are the days when prospects searched exclusively from desktop browsers. Today, consumers are searching the Web across numerous devices (often at the same time), which means you need to pay attention to where your most valuable leads are coming from. This is where device targeting comes into play. Let’s say that you want to appear on results across both desktop and mobile searches, but that mobile traffic is more valuable to you. You could specify that a portion of your budget be used for desktop, but a greater portion be allocated to mobile devices. You may even want to devote more money to traffic coming from specific types of mobile device, depending on what you’re advertising or your ad copy. Setting a daily budget and understanding how it will be depleted are the most important aspects of budgeting for PPC, but it pays to be aware of how advanced targeting options can affect your ad spend. How Much Does A Typical Click Cost In AdWords? Once you know what PPC is and how paid search works, it makes sense that your next question might be, “How much does a typical click cost?” As I mentioned earlier, though, this is not an easy question to answer. In some ways, you can think of PPC advertising roughly along the same lines as traditional print advertising; you’d expect to spend more on a glossy full-page ad in a national magazine than you would for a classified ad in a local newspaper. In digital marketing, the distinction isn’t in the format of the ad, however, but rather the commercial intent of and competition for the keywords you’re bidding on. Some keywords are significantly more expensive to bid on than others, depending on how competitive the market is, and it’s important to realize this before launching a PPC campaign. In the US, if you average across all different types of businesses and keywords, the average CPC in AdWords is between $1 and $2. That’s on the search network. On the display network, clicks tend to be cheaper, and the average is under $1. However, in super-competitive markets, clicks can get much pricier. 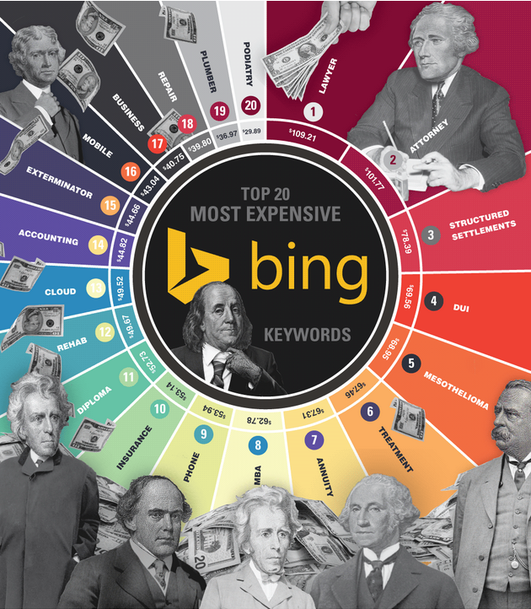 Let’s take a look at some of the most expensive keywords in AdWords and Bing to give you an idea of how much a click can cost if you’ve got deep pockets. As Google owns the largest paid search platform, we’ll focus on AdWords first. You can check out the full infographic and learn about the methodology behind the data here. As Bing is growing in market share, we decided to conduct a similar study to find the most expensive keywords in Bing Ads. Of course, these are just some of the hundreds of thousands of keywords that businesses all over the world are bidding on, and costs can vary widely depending on a wide range of factors. Even if you’re in an industry with high average costs-per-click, such as insurance or legal services, it doesn’t necessarily mean you’ll be forced to pay these amounts for each click on your ad. Furthermore, it’s important to take ROI into account. These industries can afford high CPC’s because the average lifetime value of a customer is so high. People sometimes like to point at the grand, show-stopping keyword categories above as a definitive example of how expensive PPC can be. The reality, however, is that these keyword categories only make up a small portion of total search volumes. Long-tail keywords actually account for the majority of Web searches. Let’s take another look at the list from Bing Ads above. See the keyword category “Exterminator”? This category has an average CPC of $44.66. While some users may indeed perform a search for “exterminator [their town]” if they discover their house is infested with pests, other users may opt for a different approach – one that yields opportunities for the smart advertiser. What if someone performed a search for the long-tail query, “How to get ants out of my kitchen”? They could be looking for do-it-yourself advice on how to rid their kitchen of ants, but they might also be open to seeing an ad for an exterminator (and if you’ve ever tried to keep ants out of a kitchen, this scenario suddenly becomes a lot more plausible). This is the kind of opportunity that long-tail keyword targeting presents to advertisers. In addition to making up the vast majority of searches, long-tail keywords are also often significantly cheaper than shorter keyword-rich queries and can have as much – if not more – commercial intent. How Much Do Typical Businesses Spend On PPC? Usually, once someone has asked about the average cost-per-click of a PPC ad, their next question will be how much do “typical” businesses spend. Unfortunately, this is another question without an easy answer. However, that doesn’t mean I can’t tell you a little bit more about how much a “typical” business spends on paid search. First, we need to look at overall spend data by industry. As you can see, companies in the financial and insurance sectors spend the most by a significant margin ($1.2 billion), with retailers coming in second. 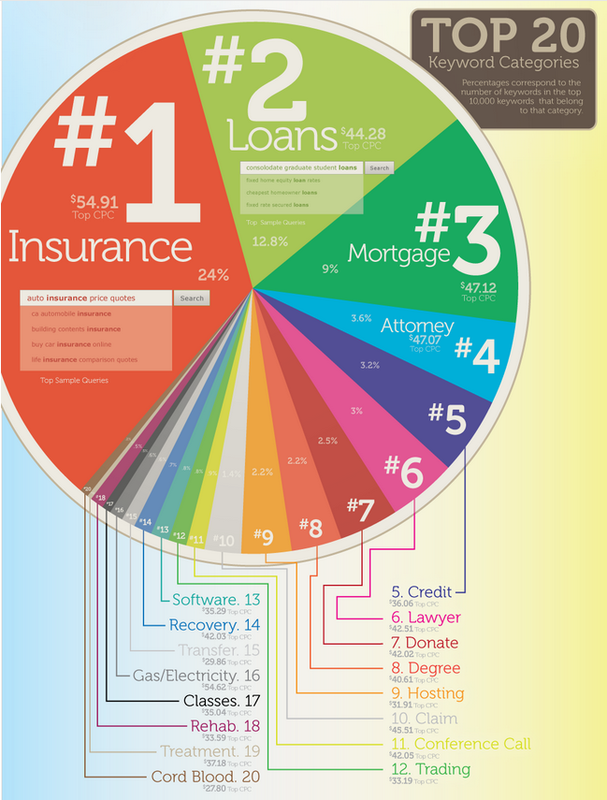 Individual companies in these industries often spend $40 to $50 million a year on Google AdWords. For example, Amazon spends over $50 million per year. Clearly, they’re getting good ROI on that spend! Of course, this data is interesting, but it’s not terribly useful to a would-be advertiser who’s still on the fence about AdWords. For one, a handful of major brands dominated each individual category – businesses that likely bear little resemblance to those who are considering getting started in AdWords. The remaining $14 billion that makes up Google’s ad revenue comes from a number of smaller businesses with smaller budgets. You don’t need to spend millions on AdWords to make it work! 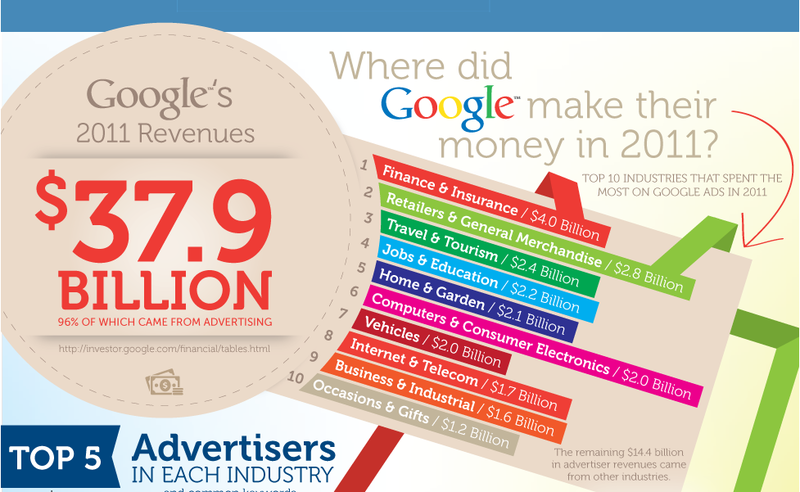 How Much Do Small Businesses Spend On AdWords? With this in mind, I asked Erin Sagin, one of WordStream’s Customer Success Managers, about how much the average WordStream client spends on PPC per month. As you might expect, Erin told me that the amount that our clients spend on PPC varies widely. Some only spend around $1,000 per month (and I say “only” purely for the purposes of context – that’s still a lot of money to many small businesses), whereas others spend upward of $30,000 per month, such as PPC management agencies. However, Erin told me that the average WordStream client (mostly small and medium-sized businesses) spends $9,813 per month on PPC advertising. This average is derived from the entirety of WordStream’s client base, including the very smallest mom-and-pop businesses right through to mid-sized PPC management agencies. Overall, the average CPC of keywords across all industries typically ranges between $1-2 – significantly less than the averages from AdWords and Bing listed above. What Other Costs Are Involved In PPC? Your ad budget will always be the largest, most direct cost associated with your PPC campaigns. However, while your ad budget is important, it’s not necessarily the be-all and end-all of your paid search efforts. There are other potential costs you may have to consider, depending on your business, marketing goals, and individual situation. Some small businesses opt to have an agency handle their PPC work for them. This approach offers several benefits, such as minimal personal investment of time and effort in actually managing your PPC account. Agencies can also boast many years of experience in PPC account management, making them trustworthy partners who can offer expert advice and guidance. Just another glamorous day at a PPC agency. However, agencies don’t come cheap. Even smaller boutique agencies will take a percentage of your ad spend, regardless of ROI. 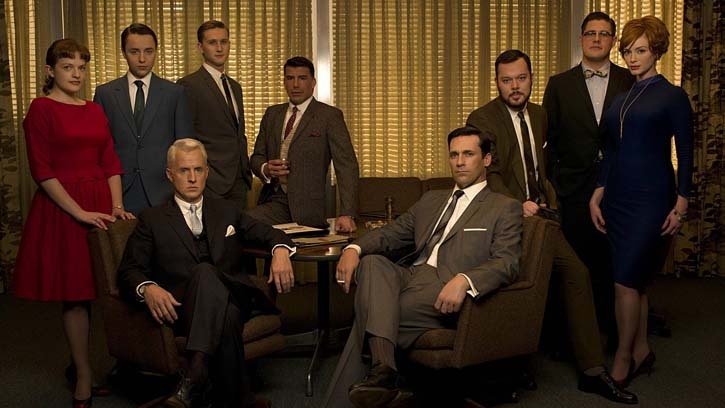 Some agencies may guarantee a threshold ROI, whereas others won’t. Agency cuts typically hover around the 10% mark, though this varies from one agency to another. Obviously it’s in the agency’s best interests to deliver results (to reduce churn and retain clients), but even if your ads don’t result in any conversions, you’ll still have to pony up and pay your agency unless it’s explicitly stated otherwise in your contract. AdWords is a great advertising platform. It offers advertisers a high degree of control over the precise variables in their accounts, and can be extremely powerful in the right hands. The biggest complaint we hear from our clients is that, for all its power, AdWords can be intimidating – especially to new advertisers. That’s why many businesses opt to use PPC management software. Some business owners opt to manage their PPC accounts manually, and I get that. Times are tough, and every penny counts. However, if you’re pushed for time or aren’t sure what you’re doing (or both), investing in PPC management software is a great way to save time, reduce costly mistakes, and get on with actually running your business. PPC software is typically licensed, rather than purchased. This means that if you want to use software to manage and automate the legwork in your AdWords account, you’ll need to factor in subscription costs. WordStream offers six- and 12-month contracts as well as an annual prepaid option, which makes budgeting for PPC software easy, but if you’re looking at another platform, be sure to understand the terms of the contract before you sign anything. As I’ve stated throughout, there are numerous factors that can have a significant impact on the cost of running a PPC campaign, but remember: almost any type of business can make AdWords work for them! If you’re not sure about anything I’ve covered in this guide, or you have specific questions, leave a comment and we’ll answer them as best we can. This article was syndicated from Business 2 Community: How Much Does Google AdWords Cost? Monday Tips: Do You Know About These Latest Social Media Tools?